If the comfort, feel and look of a log home are what you desire, then there is no substitute for a home constructed from full logs. As a matter of fact, a log home is defined as “a home built by stacking one log on top of another”. There are many myths concerning full log construction that permeate the home building industry. Many of these myths have been perpetuated by “log home”companies that build conventionally framed homes and attach rounded wood siding to the exterior and/or interior to simulate the look of real logs. Let’s take a look at these myths and examine what the truths are. Myth 1. Full log homes are not energy efficient. Truth: A full log home is energy efficient. Studies by The National Bureau of Standards, The Energy Division of the Minnesota Dept. of Public Service, and The Research Center of the National Association of Home Builders confirm that a log home is as energy efficient as a well- insulated conventionally framed home (R-19). Although a full log wall has a lower R-value than an insulated frame wall, the log’s thermal mass makes it just as energy efficient. Thermal mass is the ability of a material to absorb, store and release heat over time. The wood cells in the log do this extremely well. Once heated, the log wall will retain heat and release it back into the home as needed, causing the furnace to cycle less often thus conserving energy. In addition, 80% to 85% of heat loss in a home is through the roof and exterior doors and windows. Compared to the energy efficiency of any wall system, proper selection and installation of doors, windows and roof insulation is far more critical in the overall energy loss of a home. Myth 2. Full Log Homes are very expensive and unaffordable for most people. Truth: Although the material (logs) for a full log home’s exterior walls can be more expensive than a conventional “stick-built” home, construction costs for log walls can be much less. 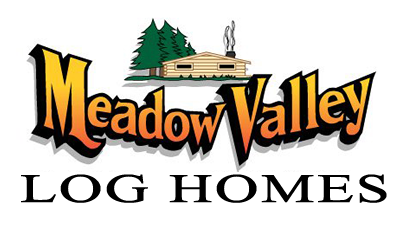 It takes Meadow Valley’s log construction crew an average of just three days to fully erect all exterior log walls on most homes that we build – and that includes all door and window openings as well as all full log gables. As the logs are stacked, the wall is completed both inside and outside. Compare this to having to have a crew first frame the walls and construct window and door openings, then sheath the outside, then apply a house wrap to prevent air filtration, and then install siding to the exterior. Now let’s move to the inside. There is insulation and vapor barrier to install in all stud cavities. Next there is sheetrock to hang, and don’t forget that the sheetrock needs to be taped , mudded and sanded. This whole process can take weeks instead of days. As we all know, time is money especially when paying a construction crew. The savings on labor in erecting a full log home goes a long way to offset the extra material cost of a solid log wall. In addition, once the exterior log walls are constructed, the rest of the construction is the same as any conventional home. The roof goes on in the same way and uses the same materials. The windows and doors are the same. Interior partition stud walls go in the same way. The HVAC system is the same as is plumbing and electrical. Floor coverings, cabinetry, countertops, fireplaces and appliances are all the same. In short, once the exterior walls are up, very little is different from conventional construction both in terms of material and labor. Myth 3. Full Log Homes are inferior to “split-log” or “insulated-log” homes. Truth: By “split-log” or “insulated-log” homes, we mean a home that is conventionally built with exterior stud walls. A half log is then attached to both the outside and inside of those walls. The claim by those companies that sell this type of home is that this is the only way to end up with a log home that is energy efficient. By now we know this is not true – see Myth 1. The biggest drawback to the “split-log” construction method is the cost. If you think about it, it requires building the wall twice. Instead of stacking full logs to form the wall, the wall is first framed, sheathed and insulated. This creates a structurally sound wall. Now to this wall, they add one half of a split log to the exterior and the other half to the interior. These two “split-logs” together alone would form one structurally sound full log wall if they had not been split. In effect, the wall has now been built twice with a huge increase in both labor, construction time, and material. By contrast, a full log wall will be constructed much quicker and at a significant cost savings and the owner has the right to say he lives in a real log home – not a log sided home. Myth 4. Full log homes will settle and this causes problems that require expensive construction practices. Truth: The issue of log shrinkage and settling can be an issue that needs to be addressed when talking about some full log home builders. Meadow Valley’s tried and true log fastening system and window/door buck construction reduces the issue of log settling to one of insignificance. No special construction measures are required to finish a Meadow Valley log home. The interior partition walls can be attached directly to the exterior walls without slip joints. The same can be said for installing kitchen cabinets, stairs, plumbing and electrical. With a Meadow Valley log home your windows and doors will continue to open and close properly for the life of your home. Myth 5. Full log homes require too much maintenance. Truth: Some periodic exterior maintenance will be required on a full log home, but it is no more than any other home having a wood product exterior such as cedar siding. Proper planning and design of your log home can go a long way in keeping exterior maintenance to minimum. Proper height of foundation walls will keep rain from splashing up onto your logs as well as keep snow drifts at bay. Proper roof overhangs protect your logs from both rain and sun exposure. Locating and positioning of your home on the lot can help take advantage of shade trees and wind breaks. Today’s modern exterior log home stains and finishes can contain mildewcides, insecticides, and effective UV blockers. These products are not just for looks. They do a great job to protect your logs and many recommend reapplying only once every three to five years or more. We think that is a small price to pay for living in a home as beautiful as a full log home. Truth: The only walls in a full log home that need to be log are the exterior walls. Interior partition walls as well as all ceilings can be finished with any material the homeowner desires. Of course, any and all floor coverings can be used in a full log home. The homeowner has complete control over how much or how little of “the log look” they want in their home. Truth: Think about building a campfire. You would never think of holding a match to a 9 inch round log until it caught fire. Instead you would start by lighting much smaller pieces of wood. 2X4 studs will ignite much more quickly than a full log, and a stud wall provides a cavity through which fire can often travel quickly. Besides being more difficult to ignite, full log walls have no cavities through which fire can grow and spread. In the event of a major fire, a full log home will typically char and it is unusual for one to completely burn down.